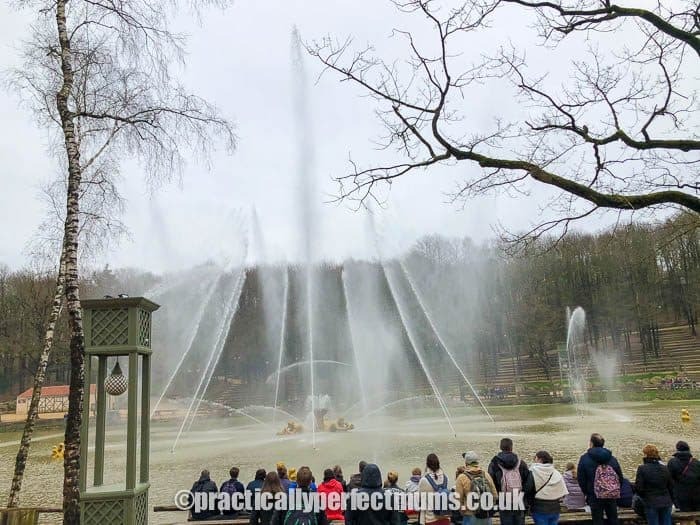 Have you heard of Puy du Fou, the multi-award winning theme park near Nantes? No? 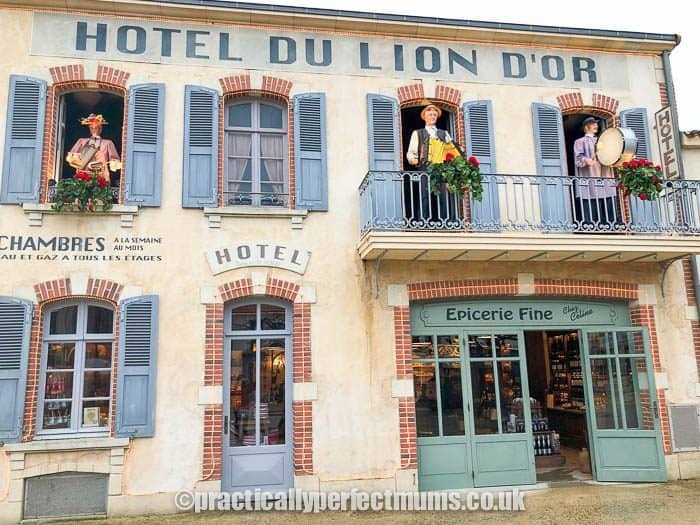 Neither had we until we were invited to visit when they opened for the season this Easter, even though it’s France’s second largest theme park which has been around since 1977 and welcomed a whopping 2 1/4 million visitors last year. 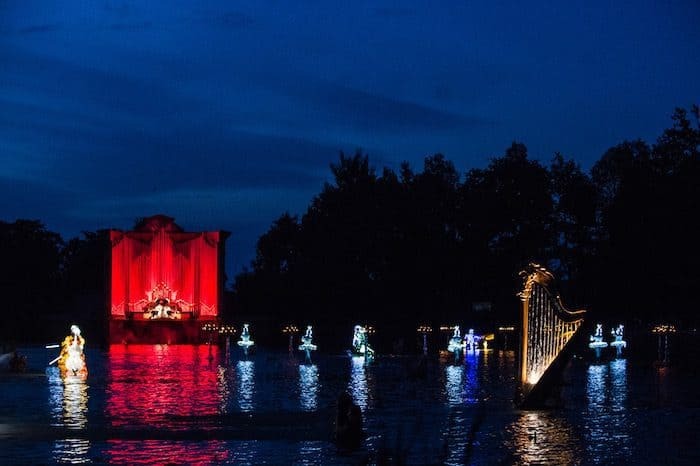 Within a pleasant rural setting in the heart of the Vendée region of France, Puy du Fou produces spectacularly innovative historical shows and has twice been voted, “best theme park in the World” and yet there’s not a ride in sight! You might think I’d had one bière too many if told you that on day one of our visit we watched a dramatic chariot race, marvelled at an orchestrated ballet of over 200 flying birds and saw wild animals prowling around a plucky damsel tied to a stake but this is just a typical day at Puy du Fou. 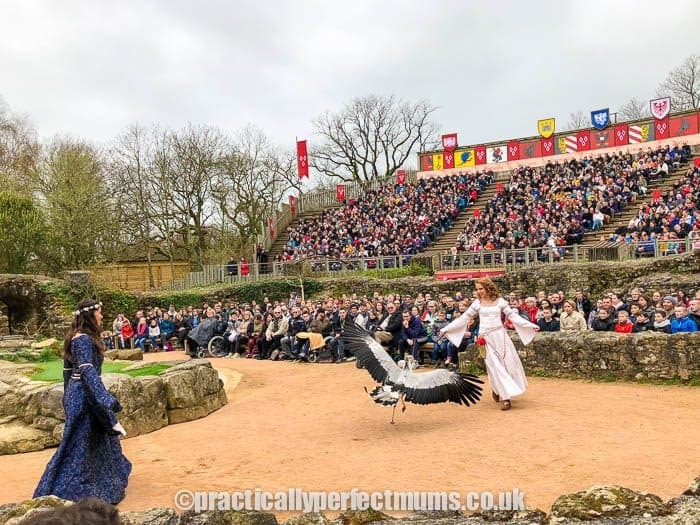 Before we went, people assured us how much we were going to enjoy it, but we couldn’t quite our heads around the concept of a theme park with no rides, so I thought it I’d give you a heads up in case you fancy indulging in the crazy Puy du Fou experience! 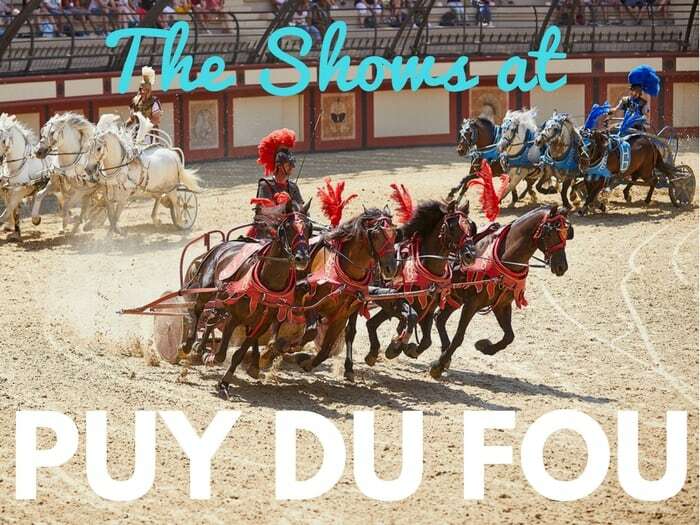 You can’t see everything at Puy du Fou in a one day visit so we’ve put together a handy guide to the shows which I hope to help you get the most out of it if you decide to visit. The atmosphere in the imposing 6000 seater coliseum is super-charged as the audience witnesses ‘life or death’ challenges between Roman occupiers and Gallic rebels who will need to survive a series of challenges if their lives are to be spared. Suitable for all the family (as long as noisy audience participation isn’t an issue). We were amazed to see wild animals including a hyena and lions released into the arena where they roamed freely amongst the actors! The atmosphere was alive with cheering and jeering as colourful gladiator battles and exciting chariot races played out in the arena below us.This “must see” large-scale show is packed with dramatic, fast-paced action and the actual possibility that a young French woman tied to a pole could actually get eaten by a lion! Top marks from us. Set outdoors in the quiet village scene of Fort de l’An Mil, a wedding is interrupted by a Viking warrior attack. Packed with special effects this show features a twenty metre long ship rising out of the water, a village set on fire and one character disappearing before our eyes. 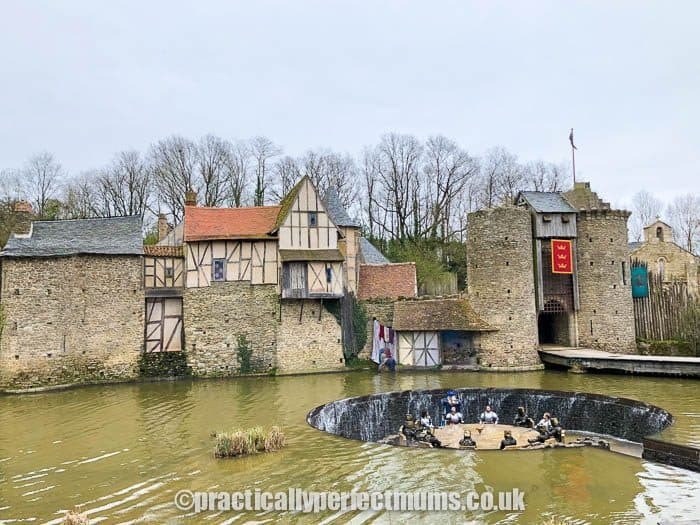 Lots to see and a romantic storyline in this action packed spectacle with large-scale special effects, clever stunts, roaming wolves and an impressive village set complete with its own river and bridge. Another top-notch show! Set outdoors amidst castle ruins, Eloise and Aliénor attract an aerial ballet of over 200 birds in flight including owls, eagles, falcons, vultures and kites as they remember days gone by. Looking like fairytale princesses in their pretty period dresses, the young women charm us as they handle and play with the birds of prey. Steer clear if you’re scared of birds. There are A LOT and they fly REALLY close to the audience which is ace if you like birds but might not be everyone’s cup of tea! Expect spontaneous “oohs'” and “ahs” to escape from your mouth as birds swoop so close you can feel them breeze past your face. We’ve seen falconry displays before, but nothing which compares with this extravagant scale (and I’m not sure how anything ever will again)! With my rusty French A level, I only understood snippets of the French dialogue (we hadn’t managed to collect our english translation headsets yet) but that didn’t detract from the beautifully orchestrated display! Don’t miss this one either. Set outdoors in the Hundred Years War, a shepherdess achieves magical powers when left to defend an enchanted castle against enemy invasion. Colourful story of jousting knights with trick horse riding and probably THE best set at the whole of Puy du Fou (and that’s saying something!). Expect expert horsemanship, special effects on a huge scale and an extremely clever castle! This appealed to everyone and was one of our favourites. This Musketeers’ adventure is enacted in a vast theatre which boasts the biggest stage curtain in the world. A pantomime style performance complete with glitzily-attired male narrator, rhyming verse, dramatic sword duels and plenty of scope for stunts, equestrian tricks and special effects. Some of the shows have warm up acts but this one, involving a small child plucked from the audience, a couple of fencing foils and a big dose of audience participation, was the funniest. It took place on the raised platform right in front of us while the giant red drapes were still closed. 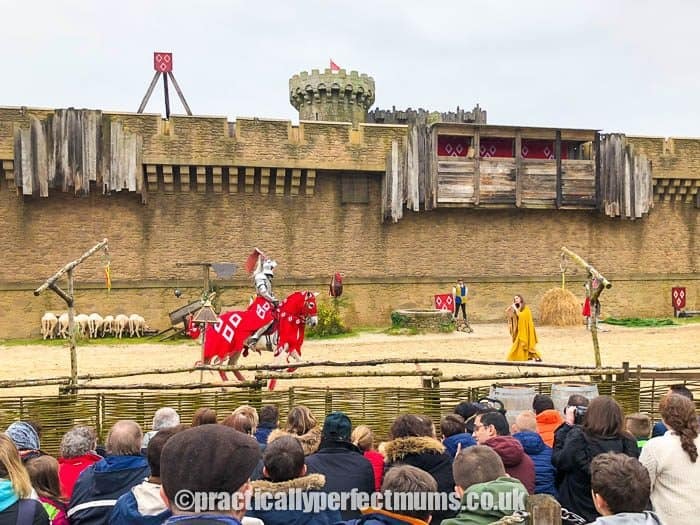 Although the stunts, flamenco dancing and rain effect are impressive, the husband and boys had been looking forward to a sword fighting fest and would have liked to have seen a lot more of that. Les Mousquetaires didn’t quite hit the mark for us. Expect to see extravagant naval sets, period costumes, horses on stage and even the sea from your seat! Set in a huge, rotating indoor theatre, this high quality production follows the eighteenth century tale of a French naval officer at the heart of the French Revolution. Le Dernier Panache is an immersive experience featuring the sights, smells and sounds of battle through a mixture of film and live theatre. Scene changes are frequent and slick: our seats revolved (or was it the theatre?) and giant drapes slid across to reveal the intersection of a huge ship or a battle scene. I absolutely loved Le Dernier Panache. It’s so hard to choose between all the high quality shows on offer but this may have been my favourite. 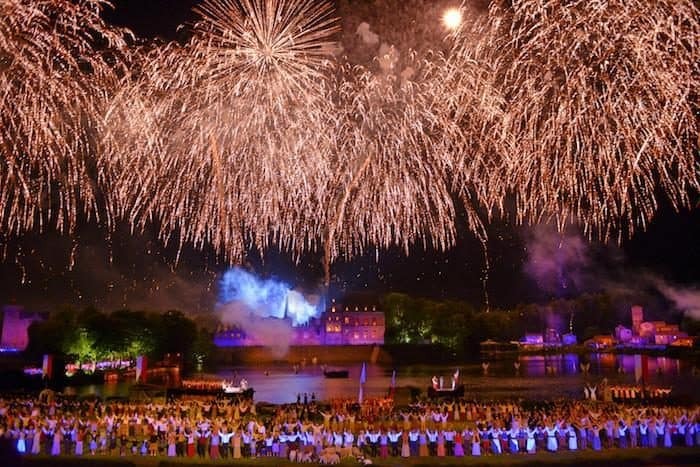 Les Orgues de Feu is an extravagant night-show set on the park’s lake. It features characters dancing on water (as you do!) and impressive illuminated displays with huge jets of water and fire, synchronised to rousing popular classical music. Outdoor seating on rustic wooden benches in the Emotion pass area. We saw this on our last night and it was the perfect “big number” to end on. La Cinéscénie is the huge night show involving 2,400 actors (no, that’s not a typo!) on a stage that’s almost one square mile in size. Unfortunately we couldn’t see this as it wasn’t on yet when we went at Easter but I’ve been told that Cinéscénie is just the most spectacular thing ever! Legendary story of Merlin, King Arthur and the lady of the lake with special effects including levitating round table, shooting fire and water as the sword was drawn from the stone and water separating as the giant round table descends into the lake! Great show with an impressive set featuring a castle and a lake and clever special effects. We were impressed and came away wondering why it’s not deemed to be one of the ‘grand’ shows! Music is performed by automatons who appear at the balconies of “Le Bourg 1900”. A short musical interlude which was starting as we finished our meal at Le Bistrot, just opposite. An amusing little spectacle if you happen to be nearby. 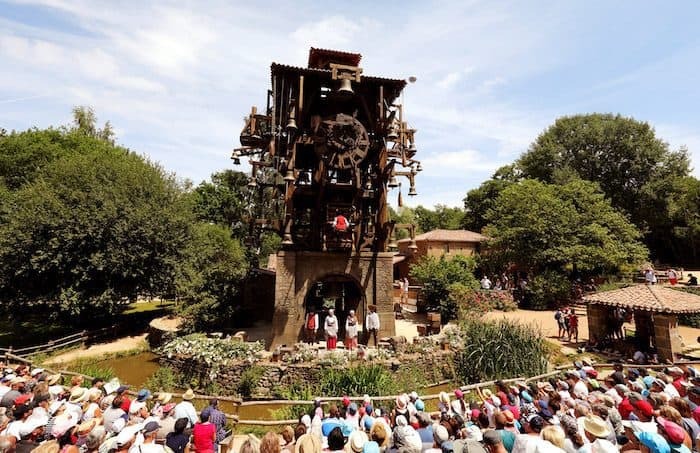 Added in 2017, a giant clock tower with exposed mechanism featuring an elevated carillon (set of bells played using a keyboard) and acrobats performing in time with the bells and chimes in the eighteenth century village. A completely bonkers bit of fun which you really need in your life. If you’ve ever seen anything like this somewhere else, I’d love to hear about it! Aquatic ballet set to baroque music. What you’d probably expect. Impressive jets of water in time to music! Immerse yourself in the sixteenth century at Puy du Fou castle where former inhabitants have reappeared from the past to give you a tour of this listed historical monument. 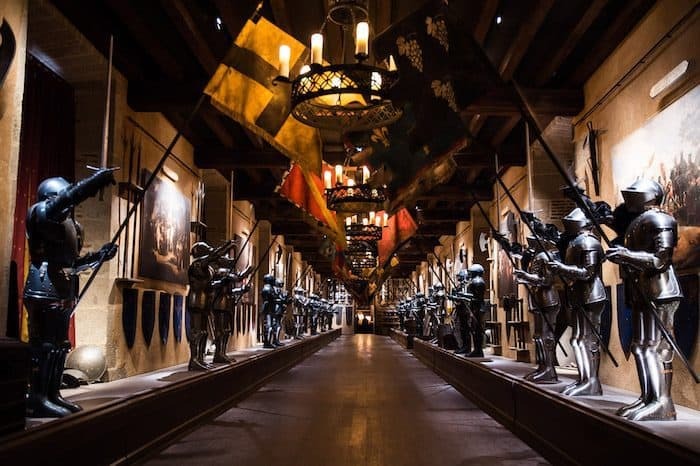 As you’re guided through underground passages and the weapons rooms you’ll be told stories about the castle’s history. Unfortunately there’s no English translation at the moment so we couldn’t follow what was going on. Interactive walk-through taking you through the centuries from ancient Rome to the French revolution. There’s a lot of talking in French and no English translation so we found it hard to follow the story. There are some fun special effects but I wouldn’t rate it highly for non-French speakers. 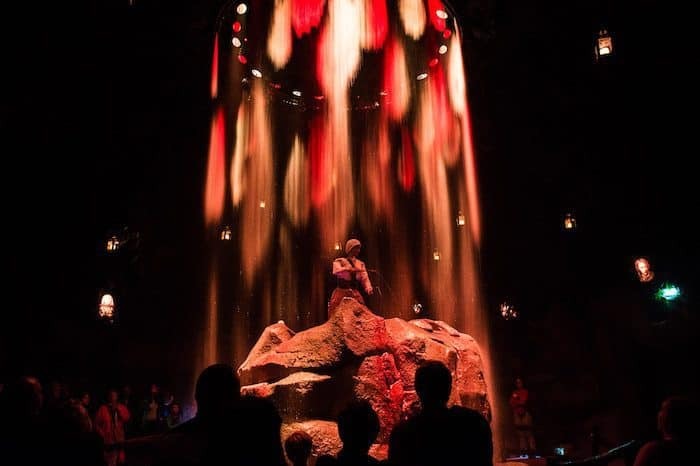 New for 2018, La Mystère de la Pérouse is a multi-sensory experience which simulates an eighteenth century voyage of discovery. 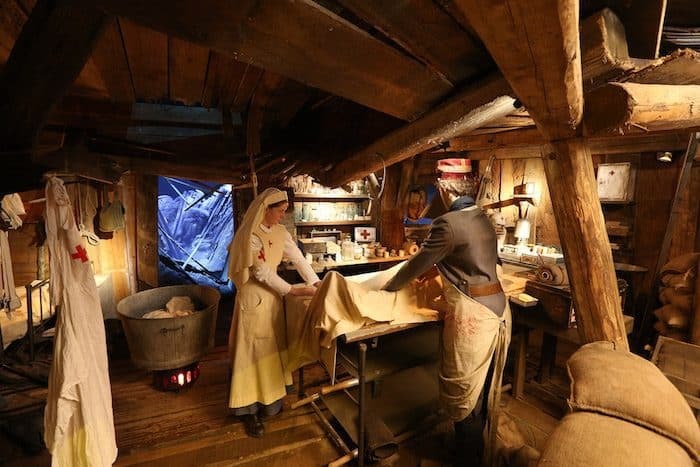 After you’ve ‘boarded the period ship’ at Brest, you can wander around looking at the unusual specimens and artefacts which have been collected from foreign shores and look out at the movement of the sea outside. You may feel as though you’ve gone back in time but modern technology is at the centre of this experience, like the 3D video projections which suggest you’re in the middle of the ocean! Suitable for all the family? 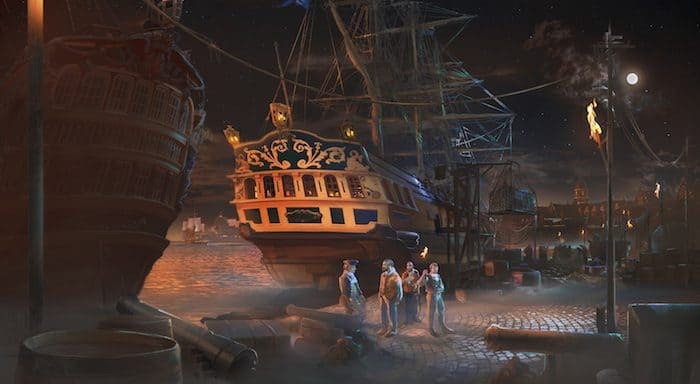 Yes, although it’s dark and noisy in places and the ship effects are quite realistic so may not be ideal for the claustrophobic or those who are nervous or sensitive to loud noises. Our nine year old scooted through this one pretty quickly! You really get the impression of being on a ship as you feel the roar of the ocean under your feet, see the walls rocking up and down, feel splashes of the water which is surging through the roof, notice mounting concern as you move around the ship amongst the crew and hear the racket and smell the gunpowder as canons are fired right next to you. 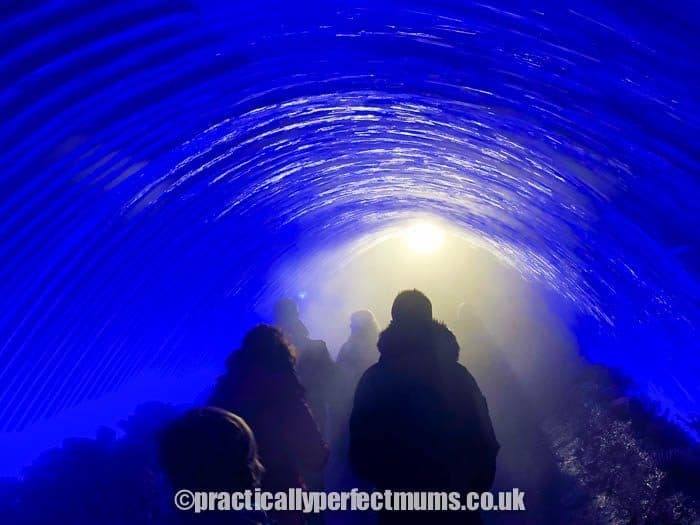 I should think they’ve had a lot of fun creating this thoroughly immersive experience – what a great addition for 2018! Walk into an underground network of first world war trenches and get a taste of life in a hell-hole like this. See the urgency in the communications room and the infirmary and imagine the fear as you feel the vibrations of noisy gunfire nearby. Suitable for all the family? The trenches are quite dark and noisy so this may not be ideal for the claustrophobic or children who are nervous or sensitive to loud noises. This was a real eye opener for me. I had no idea that world war one trenches could contain such a complex network including hospitals and radio communications. Our nine year found this interesting but wasn’t a fan of the noisy dark confined space. The rest of us found it a fascinating and emotional experience. I’d highly recommend a visit. 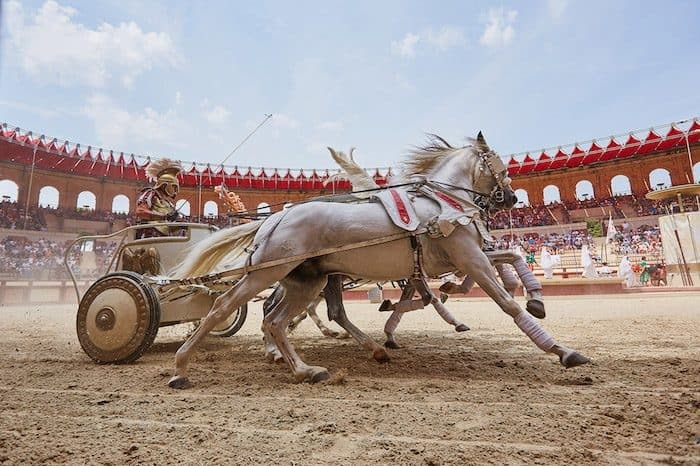 We go to the theatre a fair bit, but the shows at Puy du Fou are something quite different. It’s an amazing experience of surprises, head-scratching-spectacles and trying to separate reality from illusion. Unlike some holidays, this wasn’t just fun for the kids. We ALL enjoyed the Puy du Fou shows. 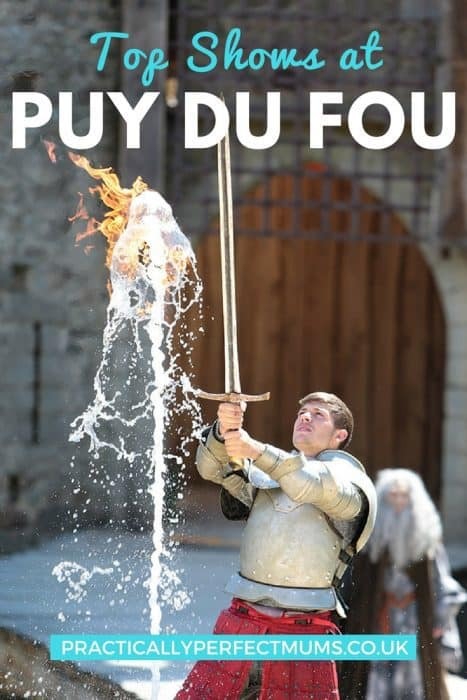 If you’d like to find out more, watch this space as I’ll be writing another article about Puy du Fou soon. 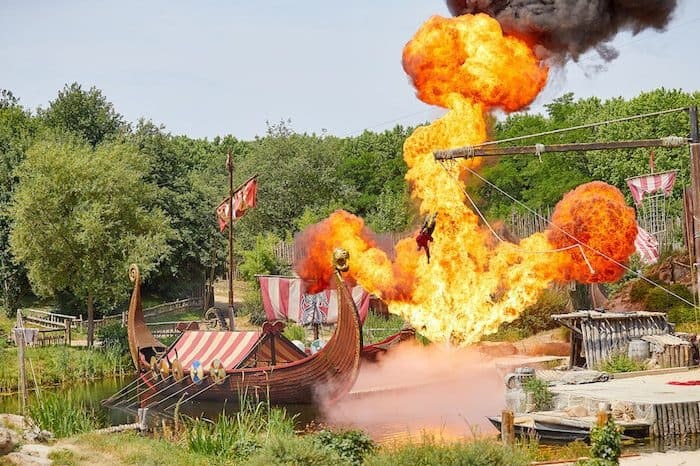 I hope this has given you a flavour of what to expect at Puy du Fou. Have you ever been? If not, have we sparked your interest? Is it the sort of place you’d like to visit? Please do let me know in the comments below. We stayed on-site in medieval-style at La Citadelle which is the newest hotel, having only opened last year. You can get a real feel for the accommodation in our La Citadelle Hotel Video which features a tour of the hotel and room. Click on the arrow below to watch it. MANY THANKS TO PUY DU FOU FOR HOSTING US. ALL OPINIONS ARE OUR OWN. MAY CONTAIN AFFILIATE LINKS. I’m definitely saving this info as it sounds great and we are thinking about heading that way next year so would be ideal. 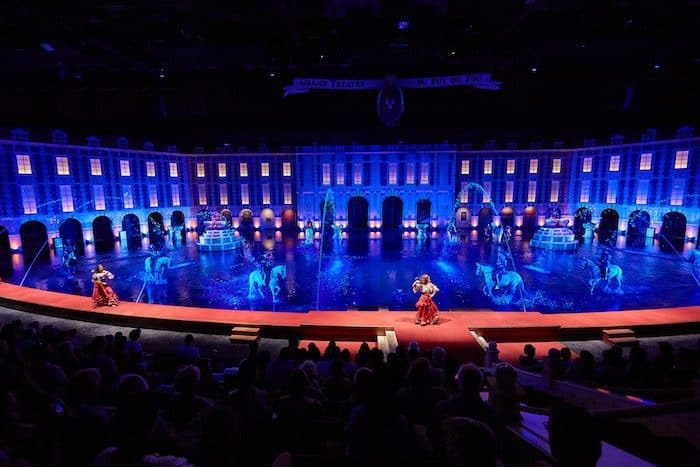 I’ve heard a lot about Puy du Fou but this is a great in-depth report on the shows and what to expect. Sounds like staying on site is a good idea. Is it easy to get to from Nantes? These are great shows! Something the whole family can enjoy together. Next post: Miss Saigon Review: All Set to Have Your Heart Broken? !